Providing confidential, professional services customized to your needs and your lifestyle. We offer a wide variety age management services. We customize your treatment plan to fit your needs. Our experienced staff will help you determine the best services for your needs and deliver the kind of quality and value you expect from a professional medical aesthetic age management clinic. Our location is designed to make your experience enjoyable and leave you feeling inspired! Check out our complete service menu below to get a feel for what we do. Please note: Service prices and availability are subject to change without notice. Medical aesthetic services are for the treatment of age and lifestyle related skin, body and facial changes. Improvements in the appearance and the complexion, expression & facial lines and other aging and lifestyle defects may be achieved through the diagnosis and application of various treatment modalities such as light therapy devices, radio frequency devices, dermal fillers, neuromodulators, medical level skin care treatments and advanced internal supplementation. All treatments and services are subject to the medical eligibility of the patient and results may vary per individual. All patient evaluations and treatments are strictly confidential. All patients must complete a face-to-face medical history with our medical supervisor or assistance medical supervisor prior to any treatment. Medical aesthetic skin services to treat wrinkles, pigmentation, rosacea, loss of facial volume, loss of skin elasticity, removal of unwanted body hair and body fat contouring. Pricing depends on number of injections sites and which product is chosen. Botox® & Dysport® smooth moderate to severe crows’ feet around the eyes and frown lines between the eyebrows. Both of these botulinum toxin injectables are approved by the Food and Drug Administration (FDA), and results can last up to four months. Restylane®, Perlane® and Juvederm® are injectable dermal fillers made from a modified version of the body’s own hyaluronic acid. These FDA approved pharmaceuticals add volume and fullness to the skin by binding with water molecules, and can last from three months to more than a year, depending on the product and your skin. Sculptra is an dermal injectable product that stimulates your own natural collagen growth to gradually restore soft natural looking volume to your facial area. Sculptra can also help restore a more youthful appearance to your hands.They volumizing affects of Sculptra typically last several years so it is is very useful in creating lift and volume in areas of the face that would otherwise be cost prohibitive to maintain using hyaluronic acid fillers. Sculptra can not be used in the lips or close to the eyes in substitution for hyaluronic acid dermal fillers but is specifically for use in the deep tissue area of the face. Radiesse® sets a new standard in dermal fillers for facial contouring and augmentation with immediate and long-lasting results. Made from a biocompatible substance that’s identical to what’s naturally found in the body, Radiesse® adds volume and stimulates new collagen production. Our chemical peels utilize custom formulated medical level chemical solutions for a mild to medium deep exfoliation experience in order to smooth the texture of your skin, reduce fine lines, even skin tone, reduce mild scarring, remove pesky blackheads and blemishes while reducing excessive oils that may cause breakouts. Your practitioner will customize your peel to your skin type and goals for improvement. Dermaplaning (removing vellus hair and the top layer of the skin loosened by the chemical peel process with a fine scalpel) may be added to enhance any chemical peel at the discretion of the practitioner. 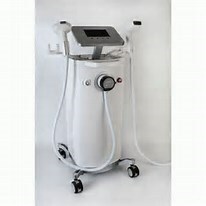 Lumecca IPL® (Intense Pulsed Light) treatment that dramatically improves skin tone and surface imperfections associated with aging and photo-damage. The correct IPL wavelength is chosen for your skin type to selectively treat the brown and/or red pigmented areas on your skin. It’s the heating of the pigmented cells that causes the therapeutic effect. Select treatment modalities repair problems right at the skin’s surface – redness, mottled complexions, brown age spots, freckles and sun damage. The Fractora skin resurfacing treatment is the first bipolar radio-frequency fractional treatment. Fractora provides dramatic skin and wrinkle improvement by fractionally ablating the skin and restructuring deeper tissue. Fractora Fractional Treatments deliver bipolar RF (radio frequency) energy to the skin through an array of pin electrodes with an ablation zone that can vary from 100 microns up to 1mm. RF current flows between the pins creating zones of ablation, coagulation and heating. The gentle heating of sub-dermal tissue promotes collagen restructuring for for a deep treatment effect. The untreated skin around the ablation zones promote fast healing of the micro-lesions to minimize patient downtime. * Versatility of parameters allows the user to vary the depth of ablation, coagulation and heating. * Versatility of settings enables the practitioner to mimic aggressive fractional CO2, fractional Erbium Yag or fractional IR laser tissue effects. * Fractora hand piece connects to the multifunctional Invasix device.This allows your practitioner to combine Fractora fractional resurfacing with other Fractora modalities like Fractora Firming or to use on its own. An unprecedented skin treatment that allows physicians to precisely provide optimal skin contraction temperatures in a manner no other RF technology can achieve. ACE (Achieve-Control-Endurance) is a built in smart sense to Achieve physician programmed optimal temperature, Control the thermal profile and the Endurance to maintain the temperature for a prolonged thermal experience, all without concerns of over heating. Fractora Firm Plus is a an RF technology with built in safeguards that overcome limitations of existing skin tightening devices and eliminate the need of external infrared thermometers. Experience the "FRAC-TOTAL FACIAL = The Ultimate Skin Renovation Treatment! Fractional meets Thermal Based Collagen Remodeling!! Qualified specialists providing the latest in medical level anti-aging skin care treatments and products. All skin care programs are customized and price determined upon consultation. We offer a variety of anti-aging skin care products & programs to give your skin a youthful and vibrant look. Call to find out more about the innovative technologies now available to restore beauty and vitality to aging skin. Pricing upon consultation. Consultation and laboratory fees vary upon individual need. Intravenous Nutrient Therapy (IVNT) is a treatment used to infuse vitamins, minerals, amino acids, and other natural therapeutic substances directly into the body’s bloodstream through a vein. Intravenous Nutrient Therapy is extremely effective in getting high dose nutrients into the body’s circulation system and to the cells where the nutrients are needed, by bypassing the digestive system. Whereas oral absorption may be 1-25%, IVNT delivers 100% of the nutrients to cells for their repair and optimal health benefit. If after an initial consultation with the doctor to determine that IVNT will be beneficial, a detailed patient specific IVNT plan will be formulated. Several factors are considered when customizing the plan, such as: detailed medical and nutritional history, symptom analysis, gastrointestinal status, and blood lab testing. The Myers Cocktail includes Magnesium chloride, Calcium gluconate, Vitamin B12 (hydroxocobalamin), Vitamin B6 (pyridoxine), Vitamin B5 (dexpanthenol), Vitamin B complex 100, Vitamin C and trace minerals. Relief of symptoms usually occurs within minutes of administering the Myers Cocktail. Although patients improve after the first treatment, several treatments, which have a cumulative effect, may be required to achieve maximum results. Please call (707)321-3071 or email us at: mymedaesthetics@gmail.com to schedule an appointment. We offer our clients a state-of-the-art web-based appointment system which will notifiy you immediately by email of all confirmed appointments and also remind you of your appointment two days before the date of your scheduled appointment. Sorry but walkins can not usually be accomodated.